Ian Paisley was a pastor and politician who was a native of Northern Ireland. He was renowned for his strong Protestant and Unionist views. For most of his political career he espoused hard-line unionism. He opposed all attempts to resolve the conflict in Northern Ireland through power-sharing between Unionists and Irish Nationalists. However he eventually became First Minister of Northern Ireland when he agreed to a power sharing government with Nationalists. Ian Richard Kyle Paisley was born in Armagh on April 6th 1926. He was ordained a minister by his father in 1946. Paisley founded the Free Presbyterian Church of Ulster in 1951 and served as its leader until 2008. The Free Presbyterian Church is a fundamentalist, evangelical church which has its headquarters, and most of its members, in Northern Ireland. On June 18th 1970 Paisley was elected by the people of North Antrim to serve as a member of the UK Parliament. He retained his seat until 2010. Following his election to Parliament he founded the Democratic Unionist Party (DUP). Paisley was also a member of the European Parliament from 1979 to 2004. Ian Paisley was opposed to the Northern Ireland peace process and Good Friday Agreement. However when the DUP became the largest unionist party in Northern Ireland he agreed to a power sharing government with Nationalists. He was elected first minister of Northern Ireland in 2007. 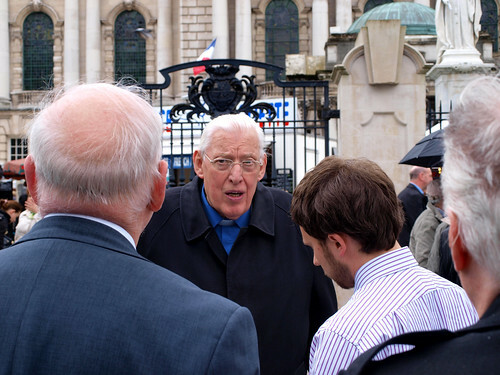 Ian Paisley, pastor and politician who was a native of Northern Ireland, died at the age of 88 in the year 2014 On This Day. Kingspan Stadium is located in Belfast, Northern Ireland. 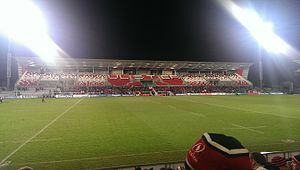 Formerly known as Ravenhill Stadium, it is the headquarters of Ulster Rugby. The stadium which has a capacity of just over 18,000 is owned by the Irish Rugby Football Union. In 2014, in a deal with the Cavan based building materials company Kingspan, Ravenhill was renamed Kingspan Stadium. Prior to the building of Ravenhill Stadium, international games involving Ireland and games involving Ulster were played at venues in Belfast such as Ormeau Road, Ballynafeigh and Balmoral. In 1923 Ravenhill Stadium was opened. The first international game was played at Ravenhill on February 9th 1924. On that occasion England won against Ireland by a margin of 11 Points. Redevelopment of Ravenhill Stadium began in 2012. New stands were erected and facilities were updated. The facilities include a shop, bar and catering facilities. There is also a gym and indoor training surface. The stadium houses an education facility known as the Nevin Spence Centre. It is named to honour the memory of Ulster and Ireland rugby player Nevin Spence who died at the age of 22 in an accident on his family farm. Ravenhill Stadium in Belfast, which has been the home of Ulster Rugby since 1923 was renamed Kingspan Stadium in the year 2014 On This Day.